1903 Public company formed as British L. M. Ericsson Manufacturing Co Ltd.
1926 Name changed to Ericsson Telephones Ltd. Ericsson Telephones made public issue of shares to fund expansion of the business, particularly to manufacture automated telephone exchanges. in anticipation of expected demand. Beeston factory employed 2000. Capability of manufacturing other kinds of electrical apparatus. 1927 After the Post Office introduced the first 'Bulk Supply Agreements' with 4 manufacturers in 1923, concerning the supply of automatic exchange equipment, a fifth manufacturer, Ericsson Telephones Ltd, became a party to the agreement in 1927. 1929 Received some large orders for automatic exchanges as well as manual exchanges and other telephone material. 1931 Had installed several racecourse totalisators; purchased British Automatic Totalisator Co; established factory to make cellulose lacquer and varnishes. 1937 New manufacturing lines established in metal powders which had previously only been available by import from Germany; extensions to Beeston factory; liquidation of subsidiary company involved in totalisators; new offics at Lincoln's Inn Fields. WWII: production of shell fuses, field telephones, motor starters, bomb releases, bomb sights, etc as well as telephone exchanges and especially radar sets and identification equipment for aircraft. 1947 Allocated large factory at Sunderland. Public issue of shares. 1948 L.M. 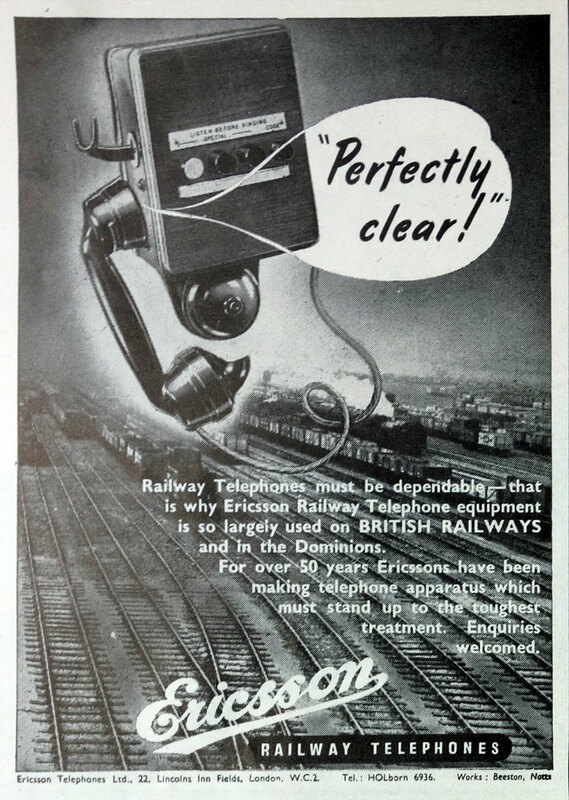 Ericcson sold its British subsidiary with an agreement that the parent company would not sell any telephone equipment in Britain for 20 years. 1949 Annual meeting told of continued growth in demand; research department expanded with several Government contracts; main business was manufacture of telephone equipment but the company was also interested in time recorders and costers, electric totalisators, specialised paints and varnishes, metal powders, burglar alarms, etc. 1954 With Pye Ltd Developed VHF multichannel radio-telephone system. 1958 Development of all-electronic exchanges expected to lead to demonstration in 1960; first exchange equipped for Telex services; doubled production of valves; nucleonic and electronic instruments would be marketed through arrangement with Solartron Electronic Group. 1958 Establishment of a joint company with Automatic Telephone and Electric Co and English Electric Co to develop manufacture transistors in greater quantities called Associated Transistors. 1960 Two bids were made for Telephone Manufacturing Co - one from Pye; the other from a consortium of Ericsson Telephones, AEI, GEC, Automatic Telephone and Electric Co, Marconi's Wireless Telegraph Co, Plessey Co and STC; Pye was successful. The consortium acquired Phoenix Telephone and Electric Works. 1961 Manufacturers of telephonic apparatus of all descriptions, including radar equipment, valves, electronics and nucleonic instruments; transmission equipment, cellulose enamels and varnishes, cabinet work, police signalling systems, stock exchange price displays, wireless headphone, inter-communication, telephone systems, time recording machines and electric totalisers. 8,000 employees. 1961 Merged with Plessey and the Automatic Telephone and Electric Co. As a result, Plessey doubled in size, becoming Britain's largest manufacturer of telecommunications equipment (including the majority of the country's crossbar switches / exchanges). 1965 Reorganisation of Plessey into 5 groups; Plessey Telecommunications would incorporate Ericsson Telephones and Automatic Telephone and Electric Co.
c.1968 L.M. Ericsson re-entered the British market supplying a private branch exchange to the Greater London Council. This page was last edited on 1 December 2016, at 12:34.